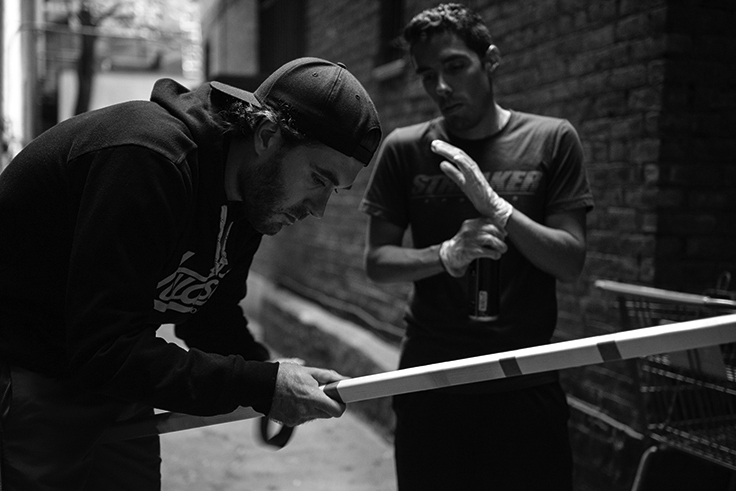 Stick by stick, Shea (left) and Pete (right) have been creating one-of-a-kind commemorative hockey sticks as Hudson Hockey Co. since late 2014. The Sienna College grads met as transfer student sophomores and immediately bonded over a mutual love for the aesthetic of old time hockey and heritage sports. The idea came from the guys just thinking it’d be a fun thing to do. In their dorm, the two sanded down two old Sher-Woods enough to remove all branding, then painted them in Pittsburgh Penguins and New York Rangers livery (Pete’s a Pens fan and Shea’s a Rangers fan). Those first sticks, humble prototypes made just for themselves, are now in the back of the closet amongst dozens of used cans of premium Montana spray paint. They now agree their first two Krylon painted sticks were crude, compared to the hot-iron branded and lacquered showpieces they’re doing now, but friends liked them a lot and asked to make more. And more. 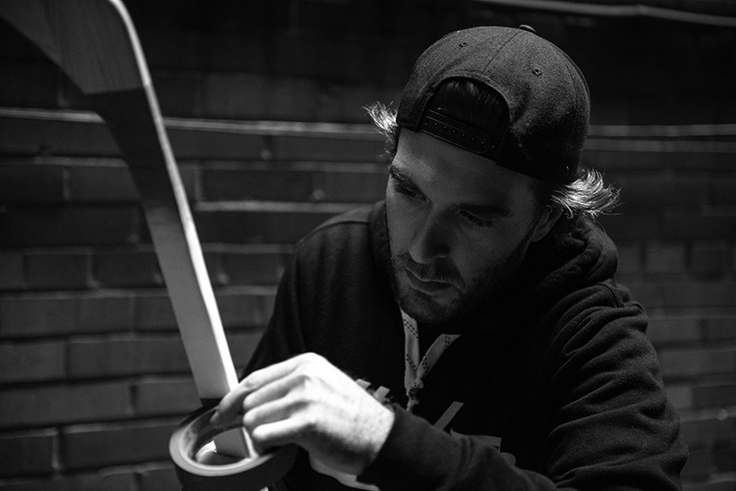 After a development period and finding a blank stick supplier in Northern Ontario, they founded Hudson Hockey Co. with capital pooled together of a meager few thousand dollars. Three months in and they’ve made enough money to float the company. But there was a hangup. “People were complaining about the fumes numerous times,” recalls Pete about the days he and Shea would spray paint in the underground parking garage of his apartment building. Luckily, they’re Upper East Side neighbors so moving the operation to an alleyway next to Shea’s apartment wasn’t a big deal, just a little sketchy. Their first colorways were of NHL and international teams (they call the repeating stick color pattern “socks”) until custom orders came in. As their business grew they garnered attention. A commissioned stick for Buffalo Sabre Zach Bogosian’s wedding found its way through all of the guests’ hands. Instead of signing a guestbook, their gifted stick became that book — signed by all at the wedding. Scott Gomez had one made for his foundation commemorating 1,000 NHL games played. One of Shea and Pete’s favorite creations was their stick to recognize Trinity College as 2015 NCAA DIII Champs. “We love custom orders because of the challenge of creating new graphics,” says Shea. And this falls right in line with their ethos: Every stick has a story.